In the online era, you can literally make money doing anything and that includes eating healthy. Yup, it couldn’t get any better than that. If that sounds like you, then you are going to like what Thrive Market affiliate program has to offer. Never heard of this place? Well, we are going to find out what it is in this review and how you can go about earning your first $20 commission. Based in the US, Thrive Market is an online store and membership site that offer natural and organic food selection to consumers. For an annual subscription of $59.95, you’ll get to purchase at a wholesale price and have the orders delivered to your doorstep. The products are packed with 100% recycled materials that aims to create minimal impact and zero waste into the environment. Profit generated from online sales will go to help feed low-income families throughout the US. Since its debut in 2014, the marketplace has been selling non-GMO and non-toxic food and gradually branching to special diets, beauty and baby products. So there’s quite a healthy range of selection to choose from. At current times, everyone is seeking for a healthy lifestyle and Thrive Market seems like a good solution for that. 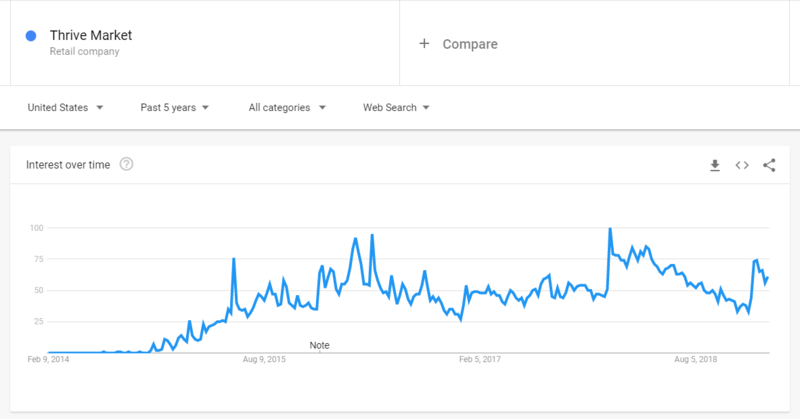 For the past 5 years, as reflected by the graph below, interest towards the brand has been growing rapidly across the nation in tandem with better food choices like organic and vegan. The site currently ranked at position 22 in the (health) product and shopping category worldwide – just 13 steps away from the popular tech company, FitBit, which by the way, also have an affiliate program. More than 90% of the visitors come from the US and the remaining from all over the world. Their most popular traffic sources are from direct (58%) and the search engines (32%). For those who are new, affiliate marketing is a form of monetizing by earning online commissions through products/services recommendation. With Thrive Market, there are ways you can make money from their program. The first is to refer friends and families as first time customers to the online store and let them enjoy 25% off of their first order. In return, you’ll earn $25 in Thrive cash, which can be accumulated and spent on your own personal purchase. This form of promotion is carried out through Facebook or email using the unique referral link that comes with your user account. The second method is to refer new customers (people that you don’t know) from the online space and make $20 in commission when they purchase their first orders within a 14 day window. There are also private commission and consumer offers available to increase your monthly earnings. In order to obtain the referral links (aka affiliate links) for this type of promotion to work, you need to own a blog (with content) and apply for the program via the CJ Affiliate network. Based on the advertiser’s details, Thrive Market currently has a network earning score of ⅘. That means, they convert very well through affiliate offers and that’s one criteria to look out for when you are selecting a brand to partner with. Those who are enthusiastic about healthy eating and lifestyle. Homemakers who want to shop for healthy selection for their families. Food bloggers with a strong interest in using organic food products and ingredients. People who generally support local farming and sustainable food production. Think you belong to one of these groups? Great! Now let’s see how you can turn this passion into an online business. This is not to be mistaken with the referral link that comes with the user account. That is merely for promoting to friends and families and as mentioned before, the reward you get is substantially different. To promote to people that you don’t know who are probably living on the other side of the country, you’ll need a blog because it can contain all sorts of information to attract a new audience, hence potential new customers for the brand. First thing first, you’d need is to choose a domain name, aka the name of your website. Prior to that, take a moment to look at the list below and think about what products within Thrive Market that may interested you the most. Food – Baking, beverage, cereals, snacks and etc. Vitamins and Supplements – Men and women’s health, sports nutrition and etc. Beauty – Fragrance, makeup, skincare and etc. Bath and body – Hair care, body care, aromatherapy etc. Babies and kids – apparel, diapers, food and etc. Pet – Food, accessories and grooming utensils. Each of these categories have got their own audience and when starting a blog, it’s best to go targeted than to go too broad. That way, you can focus on a few good products and keep it niche without overwhelming or confusing your visitors. The choice of food category should also reflect itself on the domain name. Say for example, your interest is about healthy snacks. Hence, the choice of name could be eatinghealthysnack, which by the way, is still available to purchase for about $14 per year from SiteRubix. Once decided on a domain name, connect it to a WordPress hosting, pick a beautiful theme design, set up a few basic plugins and you are good to go. Next, we shall see how we can beef up the blog with some juicy content. Considering the huge number of people searching the internet for health and food related information, creating content (video or article) for this purpose is important. When people read or watch something that have values, they are more likely to share with other people and also to buy whatever that interest them. It all starts by choosing a targeted keyphrase, one that is highly searchable in your sub niche and easy to rank for on the search engines. I use the Jaaxy keyword tool to discover profitable keyword ideas and I think you would find it very effective in your research as well. Although you are free to write whatever you want, there are a few formats that have been proven to work for affiliate offers as they sort-of reflect the buyer’s mentality when searching for information online. 1 – Product Review – Anyone who wants to make sure that their money is worth spending will instantaneously check out reviews. Some people read from short snippets of customer reviews found on the product page while some prefer a more elaborated version like what you’ll be writing for your blog. This type of article requires a lot of research and hence, is considered one of the most comprehensive content that appeals to serious buyers. Most marketers would apply their affiliate links here and it makes sense to do so because after offering so much detail, the readers are now more informed and are likely to check out the product on the merchant site. If you are the adventurous type of person and not camera shy, you can also do reviews in the form of YouTube videos. Some people refer to this as the unboxing experience and you can see a ton of them online with any kind of product – whether they are wrapped in a box, or not. 2 – Product Comparison – There are many companies that offer natural food produce and even deliver them to your house, but can their quality match with Thrive Market? That’s where product comparison comes into play and it’s often written to compare various features between two brands (or more) and provide a conclusion on which one is the best. 3 – How-To’s – A great format for those who like to share step-by-step content that brings a reader from zero knowledge to achieving something with positive results. Such articles are great for a cooking blog, a recipe blog and a beauty blog whereby products are usually part of some processes that empower people’s skills. They make good YouTube video tutorials too. Now, use the Jaaxy search bar below to see if you can discover any ‘how-to’ keywords for your chosen niche. 4 – Listicles – Sometimes, readers just want the gist, especially when they need to do a quick pick during shopping seasons and such. Creating list-type of articles can save people a lot of time and they are also easier to write because it doesn’t require extensive research. 5 – Media Promotion – As an affiliate, you are usually provided with banners, coupons and promotional codes so there’s no need to go and make them. However, just like ads, don’t pepper spray them everywhere. Placing them in strategic places like at the bottom page or side widget can create less annoyance to the readers and result in better conversion. Ready To Dive With Thrive? So there you go. From learning about Thrive Market affiliate program to choosing the best keywords for your blog content – I hope this piece of review has provided you with enough basic information to get started eating healthy and making some money on the side. While you are at it, don’t forget to check out my recommended training platform for more tips on how to grow a successful online business with affiliate products. I look forward to see you inside and let me know what you think about this review, if you have any. I was searching for a affiliate program and came across your website. I don’t know what I want yet but your blog looks good. I want to know more about the search tool you use. Jaaxy? I did a keyword search but I don’t know what all the numbers mean. Is Jaaxy an affiliate program? How do I get it? I am surprised to find out I can join Thrive and get paid on food products. Is Thrive really good? Have you done other affiliate marketing programs? I wish I could find an affiliate program that could teach me how to blog, any suggestions? This is a great idea for an affiliate as well as shopping for healthy foods. So many of these products are hard to find in our supermarkets so I am glad you brought this to my attention. My family is a big advocate in eating healthy, so getting involve in this niche will be interesting. Do we get a membership when we sign up for the affiliate program? Do you know which WordPress theme would be good to use as a niche site while displaying some products as well? Hi Chas, Signing up for the membership and joining the affiliate program are two different things. They don’t complement one another. As for the choice of WordPress theme, there are a plethora to choose from if you do a quick Google search. However, I would recommend using a paid theme if you are serious about going long term with this niche because a professionally support online store theme will withstand any changes within WordPress and provide a better user experience for your readers. I’m a health advocate myself so I’d love to get into the field with Thrive Market. I’ve heard of this retailers in the past, but have never read such an in-depth review, but upon reading this article it seems to be up my alley. Will definitely join the program and take eating healthy to the next level with my blog. Thanks for sharing this opportunity with us. This program sounds like a great opportunity for me. I like the fact that Thrive Market products are packed with 100% recycled materials that aims to create minimal impact and zero waste into the environment will actually make it easy for me to market in my area where products without recyclable materials is prohibited. A very informative review of the Thrive market affiliate program. Interesting to know that you can get paid even while you eat healthy. Every little bit adds up I guess. They seem to have a wealth of products available in their online store. I like that they are eco-friendly as well as toxic-free. I will be signing up with this program to start earning my first $20. Thank you for letting me know about this program. I’m a strong believer in eating healthy and chemical free. My wife is even producing BIO Salad which we sell locally here. The business model of Thrive Market is very interesting. The only thing I have a problem with is the fact that I have to pay to be able to join. Another thing I’d need to know, does the program work outside of the US? Hi Stefan, it only works within the US for now. You don’t have to sign up for the membership if you don’t want to. Thrive Market Affiliate is next level stuff, talk about making a Yummy Payday 🙂 The features and all the help the platform provides is fascinating. I am sure food lovers like myself are going to like it. Might give it a go and see how their offers can blend with my blog.